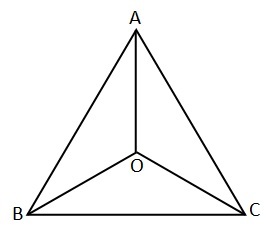 Given: In an isosceles triangle ABC, with AB = AC, the bisectors of ∠ B and ∠ C intersect each other at O.
Q2. 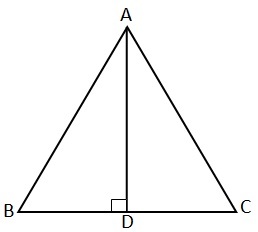 In Δ ABC, AD is the perpendicular bisector of BC (see Fig. 7.30). Show that Δ ABC is an isosceles triangle in which AB = AC. Given: In Δ ABC, AD is the perpendicular bisector of BC. To prove: Δ ABC is an isosceles triangle in which AB = AC. ∠ BDC = ∠ADC [AD is the perpendicular bisector of BC]. Q3. 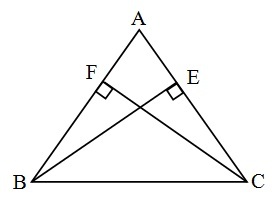 ABC is an isosceles triangle in which altitudes BE and CF are drawn to equal sides AC and AB respectively (see Fig. 7.31). Show that these altitudes are equal. Given: ABC is an isosceles triangle in which BE ⊥ AC and CF ⊥ AB where AB = AC. To prove: BE = CF. 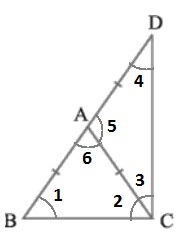 (ii) AB = AC, i.e., ABC is an isosceles triangle. Therefore, ABC is an isosceles triangle. Q5. 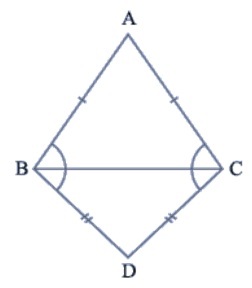 ABC and DBC are two isosceles triangles on the same base BC (see Fig. 7.33). Show that ∠ ABD = ∠ ACD. Given : ABC and DBC are two isosceles triangles on the same base BC. BCD is also an isosceles triangle. Q6. 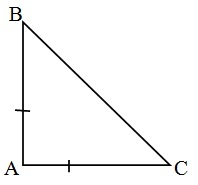 ΔABC is an isosceles triangle in which AB = AC. Side BA is produced to D such that AD = AB (see Fig. 7.34). Show that ∠ BCD is a right angle. 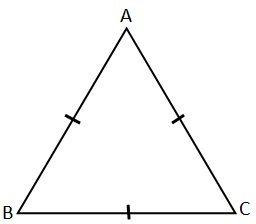 Given: ΔABC is an isosceles triangle in which AB = AC. Q7. 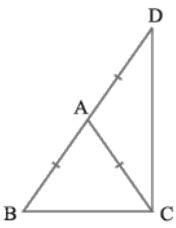 ABC is a right angled triangle in which ∠ A = 90° and AB = AC. Find ∠ B and ∠ C.
∠ A = 90° and AB = AC.